Stenhousemuir’s returning midfielder Sean Dickson was considering quitting football altogether before Stenny boss Brown Ferguson offered him a contract at Ochilview. 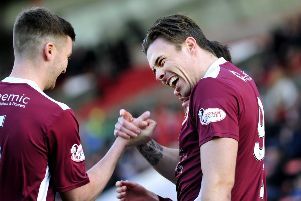 Dickson, still only 26, left Stenhousemuir in 2015, going on to play for East Fife and, more recently, Stirling Albion. The last year of his spell at Stirling was one to forget, and one that almost had him quitting football entirely. “I really didn’t enjoy my last year at Stirling, for different reasons.” Dickson told the Falkirk Herald. “With work being busy, it was taking up a lot of my time. I thought I was going to give up playing. “But Bomber text me saying they could sort a deal and they wanted to have me back and asked if I wanted to go in and see what it was like. Stenny are a club that Dickson holds close to his heart, and he had plenty of memories to look back on from his seven yeas at Ochilview which ended in 2015, including knocking holders Kilmarnock out of the League Cup at Rugby Park. But he had a clear favourite. Dickson shushed the Ibrox crowd after scoring that day, despite being a Rangers fan. “We played there before and lost 8-0. I wrote a couple of things on Twitter and some Rangers fans saw it and gave me a bit of stick,” he explained. Dickson, who made over 100 appearances in his first spell at Ochilview Park, had plenty of offers on the table, but never considered any once he knew Stenny were interested. “There was a couple of clubs at senior level interested and big ones at junior level. “There were some that would have made more sense financially and in terms of time too, but I wasn’t motivated by money. Dickson works for clothing line Be Inspired, and began feeling that playing part-time football was becoming a ‘chore’ during spells of last season at Stirling Albion. He is, though, motivated and ready for the League One season that lies ahead with the Warriors. “From being in with the boys and seeing what some people have written on social media - they have all written Stenny off to finish tenth and get relegated. “Against Partick Thistle, aside from the first six minutes, we matched them. A lot of teams would have crumbled and lost five goals but we stuck together.